The San Jose Blog: Watch the World Cup in Downtown San Jose! Watch the World Cup in Downtown San Jose! The San Jose Earthquakes and San Jose Downtown Association are going all out for the World Cup this year. They are having a series of ten free outdoor viewing parties that will span from June 14th to July 13th at the Plaza de Cesar Chavez and St. James Park. In addition to watching the game, there will be prizes from the Earthquakes, a preview of the the new stadium, soccer shootouts, food trucks, public art, and live music for the final matches. All of the details are below! SAN JOSE – The San Jose Earthquakes, City of San Jose and San Jose Downtown Association will produce a series of ten free outdoor viewing parties of World Cup soccer matches from Rio de Janeiro June 14-July 13. “The World Cup celebrates the most popular sport on the planet. These local events will bring San Jose’s countless soccer fans together to experience the excitement of the matches in a great, community atmosphere,” said Earthquakes President Dave Kaval. 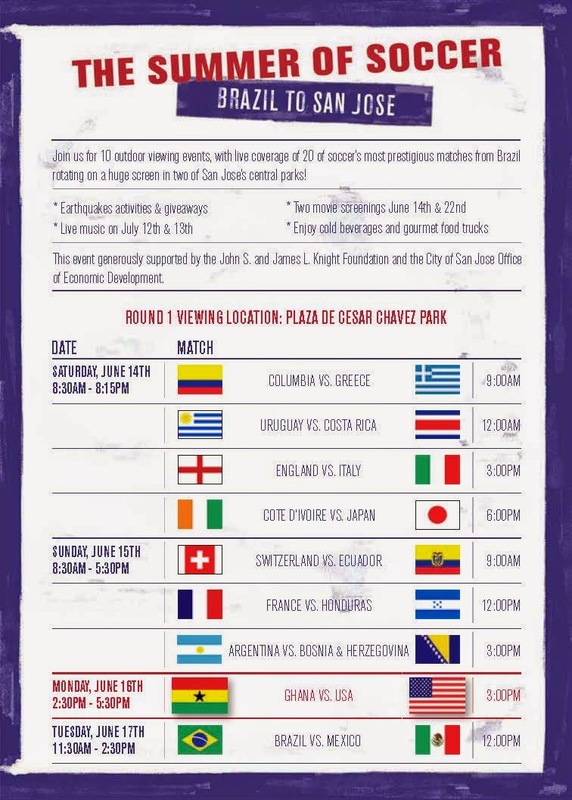 June 14: Colombia vs. Greece; Uruguay vs. Costa Rica; England vs. Italy and Ivory Coast vs. Japan, Plaza de Cesar Chavez, 8:30 a.m.-8 p.m.
June 15: Switzerland vs. Ecuador; France vs. Honduras; Argentina vs. Bosnia, Plaza de Cesar Chavez, 8:30 a.m.-5 p.m.
June 16: USA vs. Ghana, Plaza de Cesar Chavez, 2:30 p.m.
June 17: Brazil vs. Mexico, Plaza de Cesar Chavez, 11:30 a.m.
June 21: Argentina vs. Iran; Germany vs. Ghana; Nigeria vs. Bosnia, St. James Park, 8:30 a.m.-5:30 p.m.
June 22: Belgium vs. Russia; Korea vs. Algeria; USA vs. Portugal, St. James Park, 11:30 a.m.-5:15 p.m.
July 4 and July 5: Quarterfinals, St. James Park, 8:30 a.m.-3:30 p.m.
July 12: Finals, St. James Park, 11:30 a.m.-5:30 p.m.
July 13: Finals, St. James Park, 11 a.m.-3:30 p.m.
Live music preceding and following the final matches July 12-13. The public viewing will give local fans the opportunity to cheer players from their home team. The Quakes’ Chris Wondolowski will be representing the United States, while Victor Bernardez is expected to start for Honduras. For program details, visit: sjearthquakes.com/SummerOfSoccer.